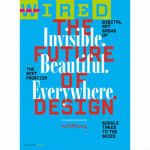 Get a free subscription to Wired Magazine. Add the item to cart then proceed to checkout. This is a one-year 12-issue subscription. Free shipping is included. Please allow 6 to 8 weeks for delivery of the first issue.